History will be made when the Memphis Grizzlies introduce J.B. Bickerstaff as head coach Wednesday in Memphis, Tennessee. J.B. Bickerstaff is the son of ex-NBA head coach Bernie Bickerstaff. They are the first African-American father and son who have been full-time head coaches in the NBA. “It’s good, and this year is 2018,” Bernie Bickerstaff said with a laugh. “I’m sure there are guys that are worthy. I’m not sure if there is anyone else. I can’t think of anybody. “Put your big boy pants on” is one of Bernie Bickerstaff’s favorite sayings. His son said he has heard it “25 times” from his father since he learned he would be named the head coach of the Grizzlies. Bernie Bickerstaff will not be able to attend Wednesday’s news conference because he has jury duty. Expect J.B. Bickerstaff to mention his father in glowing terms. Bernie Bickerstaff, 74, became a coach in the NBA when he was hired by then-Washington Bullets coach K.C. Jones as an assistant coach in 1973. After 12 seasons as an assistant that included a 1978 NBA championship in Washington, Bernie Bickerstaff was hired by Hall of Famer Lenny Wilkens to be the head coach of the Seattle SuperSonics. After five seasons with the Sonics and a 1987 Western Conference finals appearance, Bickerstaff became president and general manager of the Denver Nuggets and assumed coaching duties from 1994-96. Hall of Famer Wes Unseld hired Bickerstaff to coach the Bullets in 1997, and they made the playoffs for the first time in nine years. Ed Tapscott hired Bickerstaff to be the head coach and general manager of the expansion Charlotte Bobcats in 2003. The 2014 Chuck Daly Lifetime Achievement Award winner had a 419-518 overall regular-season record as an NBA head coach. He currently serves as a senior basketball adviser for the Cleveland Cavaliers. J.B. Bickerstaff served as a ball boy when his father was coaching the Sonics. He fondly remembers his father using ChapStick during games and the smell of it when they embraced after he got back from a road trip. One thing he learned from his father is the importance of being transparent with players. “Be honest. That’s it,” J.B. Bickerstaff said. “A lot of players sometimes don’t want to hear the truth in that moment. They respect you more for it in the long run. He’s always said that one thing players can all recognize is bulls—. If you are one of those guys who are fake, players see that. J.B. Bickerstaff recalled that his father was a father figure to many of his players. “People always want to use the term ‘players’ coach.’ But he was a father-figure type of coach,” said J.B. Bickerstaff. “He wanted the best for each individual, but he wasn’t going to give it to you easy. He never turned his eye and let things go and let things slide. He was always there and was always teaching you, pushing you and correcting you. But at the same time, he never looked at you like a commodity. J.B. Bickerstaff had the opportunity to be around NBA stars as a child. But when it came to role models, John Blair Bickerstaff chose his father and mother, Eugenia, who was a schoolteacher. Bernie Bickerstaff is a Benham, Kentucky, native who often endured racism as a child. After considering joining the U.S. Army, he accepted a basketball scholarship to the University of Rio Grande in Rio Grande, Ohio, but that didn’t last long because of the poor racial climate at the school. After a short stint working at a steel mill in Cleveland, he accepted a basketball scholarship to the University of San Diego, where he played from 1964-66. He was team captain and MVP as a senior, leading the Toreros to a 17-11 record. He became an assistant coach at the school before being promoted to head coach, holding the position from 1969-73. 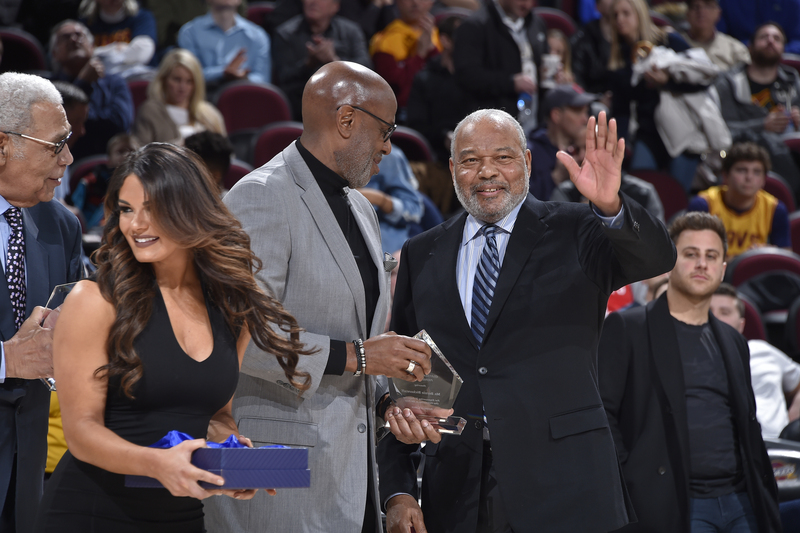 Bernie Bickerstaff (center) is honored during the game between the Cleveland Cavaliers and the Houston Rockets on Feb. 3 at Quicken Loans Arena in Cleveland. J.B. Bickerstaff’s parents also thought it was funny that J.B. wanted to follow in his father’s footsteps as a head coach. The youngest of five children said he knew he wanted to be a coach when he was 6 years old. J.B. Bickerstaff said his father thought he was crazy for following him into coaching. Bernie Bickerstaff said the family never pushed him to grab a clipboard and whistle. J.B. Bickerstaff played college basketball for two seasons at Oregon State and finished at the University of Minnesota. The 6-foot-6 forward averaged 10.9 points and 6.1 rebounds as a senior during the 2000-01 season. After his college playing days, he served as the director of operations for the University of Minnesota men’s basketball program, where he oversaw all administrative areas of the program and assisted the coaching staff with recruiting, scouting and coaching. He was also briefly a member of the media and provided color analysis on radio broadcasts for the Minnesota Timberwolves during the 2003-04 season. J.B. Bickerstaff got his first foot into the NBA when his father hired him as an assistant coach with the Bobcats in 2004. He said the best part of the job was being able to make up for lost time by spending hours with his father on and off the court. “The best thing about it, it gave us an opportunity to work together,” J.B. Bickerstaff said. “Because of his schedule and my schedule going to college and all that stuff, we weren’t together a ton and we missed a ton of time together. And those first three years in Charlotte were awesome. They made up for a bunch of time, being there every single day. After three seasons in Charlotte, North Carolina, J.B. Bickerstaff spent four seasons as an assistant with the Timberwolves (2007-11) and four as an assistant with the Houston Rockets (2011-15). On Nov. 18, 2015, he was made interim head coach of the Rockets after Kevin McHale was fired. Bickerstaff coached NBA All-Star James Harden and the Rockets to a 37-34 record the rest of the season and to a first-round playoff appearance. After the season, he withdrew his name from head coaching consideration for the Rockets, who hired Mike D’Antoni. J.B. Bickerstaff said he had the wrong mentality when he was interim head coach of the Rockets. J.B. Bickerstaff joined the Grizzlies as associate head coach under first-time head coach David Fizdale in 2016. On Nov. 27, 2017, he was promoted to interim head coach after his good friend was fired. Bickerstaff said he accepted the position after Fizdale gave him his blessing. J.B. Bickerstaff’s goal was to make the best of the interim position and try to improve daily with an injury-plagued team that was without starting point guard Mike Conley for most of the season. “That’s the thing, ‘What else are you going to do?’ ” J.B. Bickerstaff said. “You either wake up in the morning and go to work or you stay in the bed. And staying in the bed ain’t an option. It was dust yourself off. Obviously, I was affected by it because it was ‘Fiz’ and I was so close to him. But you’re put in a position of leadership and there are other people who are depending on you. Bernie Bickerstaff worried about his son in an interim role for a second time. J.B. Bickerstaff was also worried about the perception of him if he wasn’t named the permanent coach. The young, injury-plagued Grizzlies had a 15-48 record under him this season and missed the playoffs. “Having had the opportunity once before in Houston, going to the playoffs and us parting ways, no matter what I think about my skill set, my window was shrinking if I didn’t get this job in Memphis because organizations and general managers would wonder why it didn’t work,” J.B. Bickerstaff said. It ended up working for J.B. Bickerstaff, as the Grizzlies decided to renew him with a three-year contract. He believes that with a healthy Conley and center Marc Gasol, their high 2018 NBA draft pick and young players who got a lot of experience this past season, the Grizzlies have playoff potential next season. “It means a lot. After 14 years of coaching, your dream is always to be a head coach,” J.B. Bickerstaff said. “For this organization to keep me on board means a lot. It gives me an opportunity to prove my full value and worth with a full training camp to implement what you believe in. Head coach J. 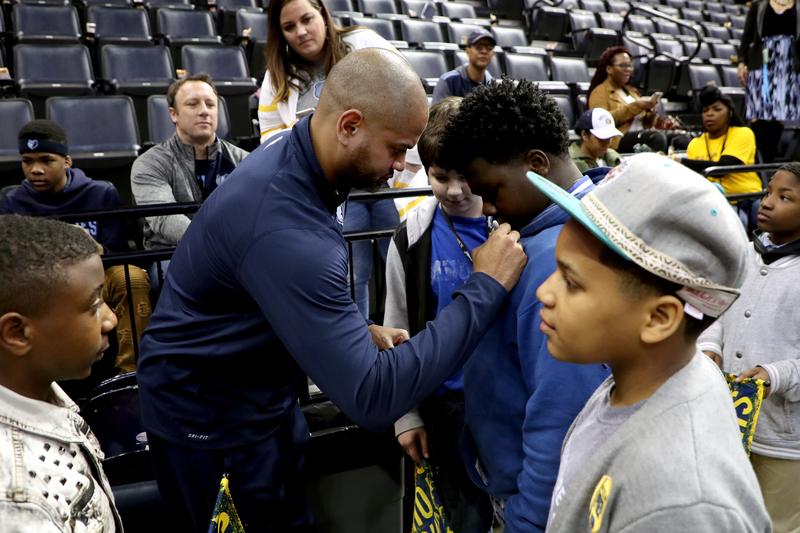 B. Bickerstaff of the Memphis Grizzlies signs autographs for fans before the game against the Sacramento Kings on April 6 at FedExForum in Memphis, Tennessee. Shortly after J.B. Bickerstaff accepted the head offer from the Grizzlies, he called his parents to tell them he was finally a full-time head coach in the NBA. His father asked him sternly if he wanted the job. His son answered with a definite yes. And instantly, black sports history was made. While his father said it’s in his family’s nature to “stay in the middle of the road” emotionally, he is very proud of his son and glad that he can finally coach the way he wants to as the Grizzlies’ head coach. Father and son remain close, talking on the phone at least twice a day. “He reached out and told me and his mom once it happened,” Bernie Bickerstaff said. “We were obviously happy for him. It had been a burden on him not knowing what would eventually happen. But he’s a good organization guy, which is what he’s always been. Basically, I am pleased that they rewarded him and recognized that.